We pride ourselves on being the masters of this world, with the ability to create, maintain and destroy, but nature, time and again, reminds us of our place on earth. We take decades to find solutions to health problems. After years of research, we come up with medicines that can prevent, manage, or cure a disease, only to find that nature has something better to offer. The number of people with cardiovascular problems is on the rise, both in America and most of the Western world. According to statistics provided by the American Heart Association, almost 50% of heart disease related deaths is caused by coronary heart disease. 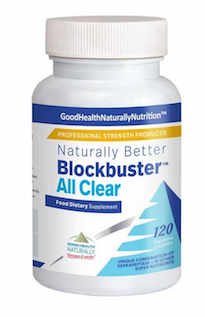 This is closely pursued by stroke, heart failure, heart attacks and high blood pressure. They also report that one in every three adult deaths in the US, is attributable to cardiovascular disease. That is over 800,000 per year, one person passing away almost every 40 seconds! Dubbed ‘Lifes Simple 7’, by the AHA, is the seven key causes and risk factors associated with cardiovascular disease. Obesity, from poor nutritional habits, and a sedatory lifestyle (worsened when combined with tobacco and alcohol) is the leading cause of high cholesterol and high blood pressure (if not inherited), and diabetes. Whilst symptoms often ‘inter-twine’, these are all health risk factors which can lead to coronary health conditions, and is fast turning out to be a headache to the scientific community. But, researchers might have just found a miracle solution in the form of the enzyme Serrapeptase, perfected and handed to us by nature! In the 1960’s, studies on silkworm resulted in a surprising and interesting discovery. At the end of the cocoon stage, the fully grown adult moth breaks out of the cocoon to fulfill its life purpose, to mate and die. To break free, the moth uses a digestive enzyme, from it’s intestines, called serrapeptase to melt the cocoon. Scientists discovered that the enzyme only dissolves dead protein-based substances. Over the years, scientists have put the enzyme’s ability to target dead or scar tissue, to good use. Doctors who deal with the issues of pain, scars, and swellings, on a daily basis, found it impossible to ignore the anti-inflammatory properties of serrapeptase. Serrapeptase has a long list of health benefits, and has no side effects, unless your body is more toxic, than normal. It is now thought to relieve inflammation related to Alzheimer’s disease and brain health, and also the pain associated with Arthritis. Serratiopeptidase is also building a big name in cancer circles, although it is currently being brushed under the carpet by medical professionals and large pharmaceutical companies. But thousands of recent studies show that this wonderful fibrinolytic enzyme, could help cancer patients more than commonly known treatments, radiation and chemotherapy, included. Scientists are slowly waking up to other therapeutic benefits of this enzyme, namely, treating coronary artery disease. This is indeed worth celebrating because, unlike other medicines with a similar mechanism of action, serrapeptase clears only dead material, without any side effects. The talk of heart disease reminds us of blocked arteries. Sure, there are other types of heart diseases, but the thought of clots and plaque build-up, scares us the most. The problem normally begins with the hardening of the arteries. This is called atherosclerosis. The once supple arteries become rigid and weak. The plaque slowly starts accumulating at such sites, resulting in narrowing of the arteries. The narrowing of the passage increases the arterial pressure and forces the heart to pump harder. If, the plaque build-up continues, eventually, the heart will not receive enough blood, which might lead to a heart attack. Of course, there are prescription medicines that can help treat and manage atherosclerosis. But, these drugs are not free of side effects. The serrapeptase proteolytic enzyme can replicate the function it does for the silkworm – that is, to dissolve the protein-based fibrin and fat deposits clogging the artery. The enzyme only clears dead substances, which later exits the body as waste material. We are reluctant to change or adopt a new approach once we are set in our ways. Most doctors still prefer laser surgery to clear blockages in carotid arteries, the tubes that carry blood to the brain. We have a problem with the current practice because the carotid arteries are situated in a very sensitive and delicate place. For one, the arteries supply blood to the all-important organ – the brain. Furthermore, quite close to carotid arteries are the hypoglossal nerve (controls the tongue), facial nerve (controls facial expressions and functions), and vagus nerve (controls the GI tract, lungs, and heart). Then, there are numerous connecting arteries to worry about. There are others methods, such as carotid angioplasty and endarterectomy, to remove plaque and prevent stroke. But, all these procedures are fraught with risk, particularly when the surgery is performed by anyone other than a highly experienced and skilled doctor. The difficult conundrum presented the advocates of Serrapeptase an opportunity to corroborate their faith in the enzyme. 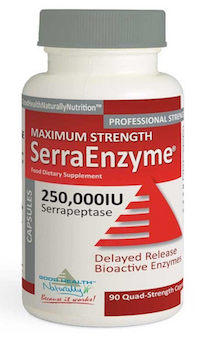 Dr. Hans Nieper (who originally discovered serratio peptidase) claims, the use of the dissolving enzyme worked remarkably well, especially in cases with severe narrowing of arteries and serious symptoms. Unlike surgery, the serrapeptase therapy is not a quick process. 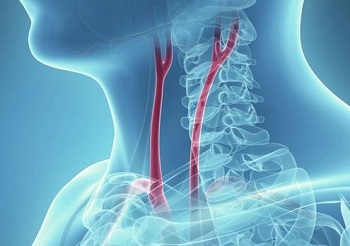 The enzyme takes time to work its magic and melt the plaque clogging the narrow carotid arteries. It takes anywhere between six and eight months for the initial results to show. It’s also believed that the patients notice an improvement in their condition two years after the initial therapy. Arm yourself with serrapeptase to effectively fight heart disease and stroke. 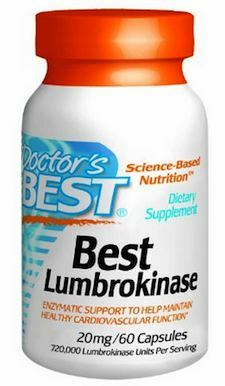 Make it part of your health and supplement regime, but only after consulting your medical professional. Also consider serrapeptase’s cousin, another fibrinolytic enzyme which the Japanese have been using for centuries. 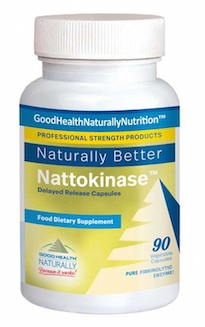 Nattokinase also has heart health benefits, but there are some cautions to consider before taking it. The Natto enzyme has side effects for anyone who is currently taking anti-clotting medications, and, for anyone with low blood pressure. It is otherwise, perfectly safe. These enzyme supplements are generally safe to use, but consult your physician before taking adding them to your supplement cupboard.